As you’d heard on our podcast a few episodes ago, Robot Roller-Derby Disco Dodgeball is an awesome game. Flat out. It’s tons of fun, high paced action that demands quick reflexes and the best arm to chuck dodgeballs at your friends. Right in their robot faces. Boom. Well now you can slam your friends on Steam as the game has officially come out of Early Access and is ready to rock. The game has several game modes, you can make private lobbies, great music, and more. It’s just got tons of content and the matches are awesome. They’re deathmatch, team deatchmatch, capture the flag, your usual game modes but then also theres a basketball and race mode that’s fun too. There are in-game powerups that change the dynamic of the game as well. Seriously, it’s fun. Mike and I both played the game for hours and it’s pretty satisfying when you get an across the map-air throw-riccochet kill. 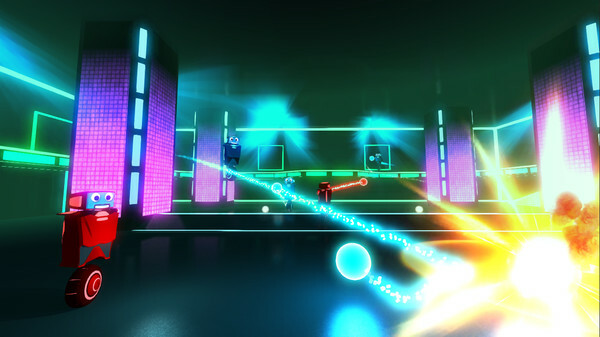 The game is $14.99 or you can be totally rad and get yourself a four-pack for $39.99 and give three copies to your friends so that you can all embrace what is the dodgeball disco. Do it. Steam Link to Robot Roller-Derby Disco Dodgeball.